CHARLOTTESVILLE, Va. (AP) - A white nationalist rally here earlier this month has brought to the surface more than just anger over the response by city officials and police to the violence that resulted in three deaths. It has also forced residents to confront some of the ugly realities of racism, bigotry and inequality that, while on heightened display that day, have long been an issue beneath the charming veneer of this progressive, historic college town. 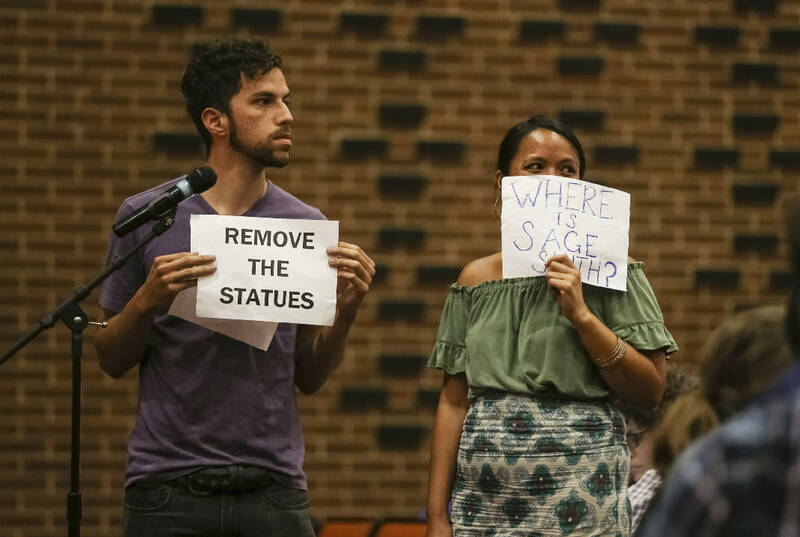 "This racism, this is nothing new to Charlottesville," said Daniel Thompson, an Army veteran whose voice rose as he spoke at the Sunday afternoon meeting billed as a "community recovery" town hall. "This is what us black residents have gone through our entire lives," he said to cheers and applause. Thompson went on to say that the city had bigger problems than the Confederate monument that sparked the rally on Aug. 12. Chief among them, he and many others at the meeting said, was the cost of housing. Others speakers pointed to a deep mistrust of police among black community members. Some called for better community mental health services, others said the education system was failing their children. The meeting was held in conjunction with the Community Relations Service of the Department of Justice, and the facilitator told the audience they would be taking notes. On a laptop connected to a large projector screen, her colleague started a running list once the first speaker stepped up to the microphone. He had a hard time keeping up. "About the police," said Katrina Turner, who wore a Black Lives Matter T-shirt. "We didn't trust the police before the rallies got here." She cited the department's stop-and-frisk statistics, which show the practice disproportionately affects black residents. In a city that's around 70 percent white and 19 percent black, more than 70 percent of all people stopped by Charlottesville police for an "investigative detention" so far this year have been black, the local newspaper, The Daily Progress reported last week , saying that follows an at least four-year trend. Susan Sherman, another speaker, said the city hadn't done enough to build up the African-American community and economy. Sherman said she recently visited the city's website looking for information about how to' support minority-owned businesses. She said she couldn't find anything about that but noted that the website touted the city's many awards for its quality of life. "What it does say at the bottom of that home page is, you know, Charlottesville, voted No. 1 city to live in, exclamation point. No. 1 city to retire in, exclamation point. And the list keeps growing, exclamation point. And I thought, for whom?" she said. A housing report prepared last year for the city hints at an answer. The most underserved segment is the city's lowest income households, and a key factor creating supply challenges is a large affluent population that desires city living and can afford to pay higher prices for housing, the report found. There is little, if any, new for-sale housing being built at price points below $250,000 for a single family home, the report said. The average price at new actively selling communities is about $430,000, said the report published in January 2016. "There's nowhere for the poor people to live," Thompson, the Army veteran, said. "And it's not just black and white. There's an economic crisis going on in Charlottesville and you all need to fix it." Charlene Green, manager of the city's Office of Human Rights, started the meeting by acknowledging the difficult events of the summer, which saw two other white nationalist rallies. But the community also bears the scars of "decades of pain," she told the crowd. In an interview Monday, Green said two things in the city's history had been at the top of her mind: first, the impact of the segregationist movement known as Massive Resistance on Charlottesville schools, some of which shut down rather than integrate; and second, the destruction of Vinegar Hill, a historically black community and the city's principle black business district, in the interest of urban renewal. "Those kinds of things happened all over the country," Green said. "But it's one of the filters that people have, especially if you were born and raised here in Charlottesville, that has an impact on how people view whether or not the city is sincere in moving forward."